Cubie, the drawing-themed mobile messaging app from Taiwan, has taken a big step to monetizing its service after it launched direct carrier billing for mobile payments in more than 40 countries worldwide. 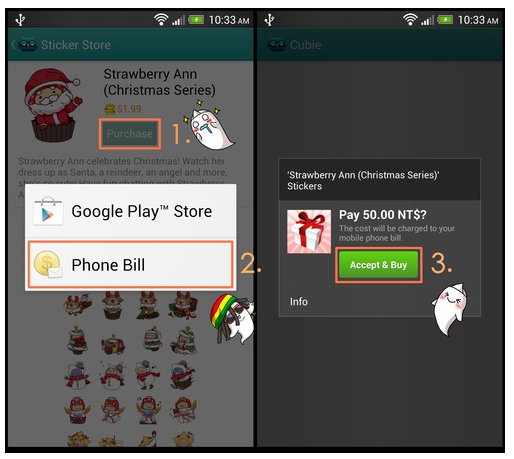 The new payment system allows Android users to buy Cubie’s virtual items — ‘stickers’ (aka rich emoticons that are popular in Asia and — yes — include cat GIFs) — from their phone, with the amount added to their prepaid or post-paid phone bill. There’s no change for iOS users since Apple doesn’t support third-party payments. To date, Android device users that have wanted to buy virtual items have had to do so via Google Play, which requires a credit card. Since credit card adoption is not widespread in many of Cubie’s primary markets in Asia, the new billing system — which is powered by Fortumo, which services Angry Birds-developer Rovio, among others — removes a major hurdle. We had one sticker pack released alongside the Fortumo integration release. In one day revenue of this sticker pack from Fortumo by itself was as much as our previous top seller that was only available via Google Play/iOS in a week. There’s no word on specific revenue numbers, but Cubie is likely to be some way behind Line, which made $58 million in Q1 2013, by virtue of its small user base. Line has accrued more than 150 million downloads to date. For now, Cubie’s new stickers are available to all users for free for an initial few days, after which they are priced at anything up to $2.50 per pack. Thanks to the Fortumo partnership, paying hard cash for those stickers that you missed out on is easier than ever before. Cubie is best-known for its Draw Something style approach, but users can also send free messages, location, voice messages and multimedia to both individuals and group chats. In addition, voice calling has been available since May, albeit as a work-in-progress/beta feature. The service supports 12 languages — including English, Chinese (Simplified and Traditional), German, French, Thai and Indonesian — and it is crowdsourcing others. The startup raised $1.1 million from 500 Startups and other investors last year, and was part of 500 Startup’s accelerator program in the US. Hill tells TNW that the service “nearing” 8 million registered users, of which more than half are on Android devices. The full list of countries where mobile-based payments are supported on Cubie includes: Australia, Austria, Belarus, Belgium, Bosnia and Herzegovina, Brazil, Bulgaria, Colombia, Cyprus, Czech Republic, Denmark, Estonia, Finland, France, Germany, Greece, Hungary, Kuwait, Latvia, Lithuania, Luxembourg, Macedonia, Malaysia, Mexico, Netherlands, Norway, Paraguay, Panama, Poland, Portugal, Romania, Russia, Saudi Arabia, Serbia, Slovakia, Slovenia, South Africa, Spain, Sweden, Switzerland, Taiwan, Thailand, Ukraine and the UK.